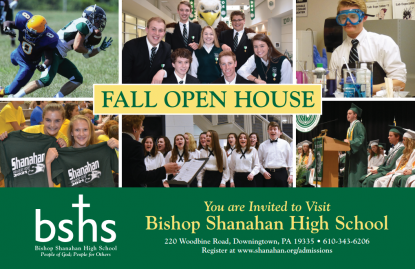 Join us on Sunday, Nov. 12 from 12 noon to 3 p.m. for the Fall Open House at Bishop Shanahan High School. All are welcome. During the Open House, you and your student will have the opportunity to learn about our academic program, meet with faculty, coaches and current students, tour the campus and visit demonstration classes. Refreshments will be provided. Visit shanahan.org for more information.